This is a continuing series about my efforts to become a farmer. Last week's downpour kept us from Farm School. with the accomplishment of many a task. under the shade cloth covered tables. it may not last long. They are hoping to get a few harvests before it bolts completely. of the red oakleaf variety in my bucket. until we each had a pretty good-sized portion. in upcoming salads is an unexpected thrill. This parsley was planted last September. Here's another that is bolting. Yet another is hosting black swallowtail caterpillars. This is the trial of slow-bolt cilantro. It's having issues with white spots on the leaves. Time will tell if it recovers. The tomatoes are absolutely through. The heat is just too much for them to flourish. for the market this Saturday. The cherry tomatoes, however, are wonderful. These Sweet Millions are juicy, tender and very low acid. A great snack to just pop into your mouth! We reseeded some of the beans that hadn't sprouted. crops planted earlier in the season. It was a productive day of work fun. These are brown widow spider egg sacs. We learned a bit about this species here. Here's another critter that's not so scary. Watch for this beauty on Wordless Wednesday. It's called a Gloriosa Lily. We got an early start on Sunday. but we managed to get a few things done before lunchtime. as he has others already started in another part of the garden. He was able to get a few harvests out of this bunch. 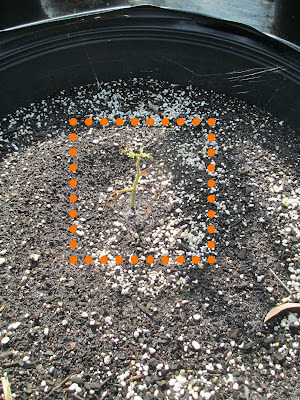 Each crop is marked with seed starting and transplant dates. We cut back the stalks to about 8 inches. Lynn took his mighty cultivator to get down to the roots. The whole kit-n-kaboodle comes out with one fell swoop. That's a healthy root system. The pots were cleaned up and the soil leveled. Man, that's some beautiful stuff. We sowed a batch of okra in the freshly tidied pots. the okra is doing quite well. It's one of the mainstays of the summer garden here. Lynn uses these professional watering wands. works perfectly for seed trays or newly sown seeds in pots. Signs of trouble were found nearby. This is the telltale sign of a critter called a leaf roller. If you pull the leaf back over, you can see the varmints going at it. They are not welcome visitors. The edemame is coming along. This was the first time I had noticed the pea-like pods. but the pods are not edible. 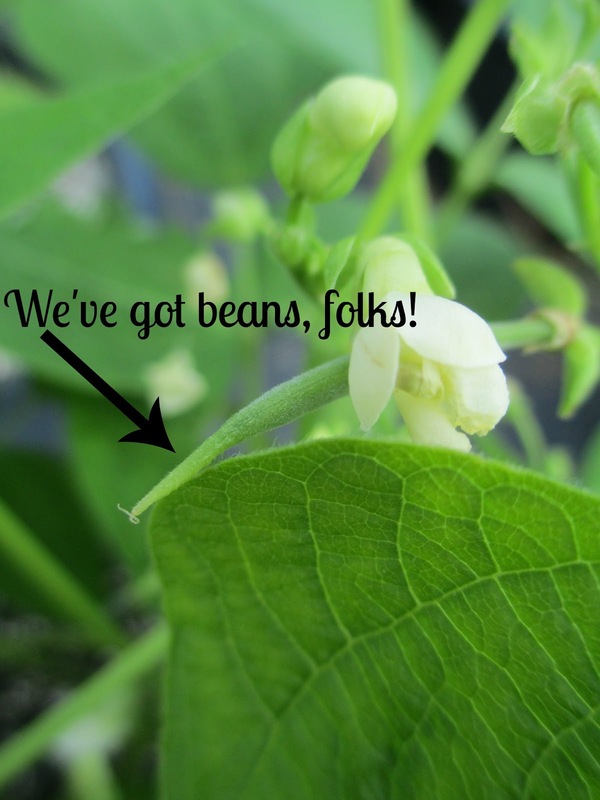 The blooms resemble the delicate flowers of the snap peas. We also got a dozen or so parsley plants started. as temps here are reaching the 90's daily. They will soon be harvesting these yummy bananas. these peppers are just the ticket. Aren't they the most beautiful shade of orange? There is so much peace and tranquility here. The place just oozes energy. Faye's keen eye spotted this critter. God sure has a wild imagination, huh? Another great day's work done. Hope you enjoyed the scenery. Can't wait to learn something new next week! It was a busy morning at Farm School. You won't hear me complaining one bit! Who needs a spa vacation when I can be here? Gotta make room for new crops! I went behind to loosen the soil and level out the pots. This bad boy does the trick. It goes pretty quickly with two sets of hands. Here's part of what we retrieved. as Faye had noticed ants in a few of them. They will be dealt with at a later time. We checked on the okra that we had sowed last weekend. Okra elsewhere in the garden is doing just fine, thank you. As well as other delectible edibles. The peppers, however, are feelin' the heat. We were on a mission to get them some relief. but bell peppers are also located in this area of the garden. Shade cloth to the rescue! as we had a lot of territory to cover. which will decrease the direct sunlight on the crops. Clothespins attach them to the metal rods stemming from the pots. Hopefully, it'll make these sweet thangs happier. and not turning bitter due to the heat. so it's got some recovering to do. plants are looking lush and downright tropical! These papayas are thriving with the high humidity. Here's something I hadn't noticed before. This is guava, which is used in preserves and pastries. The place is just teeming with life. I appreciate the time I get to spend at Farm School. It's like a vacation from reality for a few hours each week. the variety of crops we can grow decreases. are not a friend to the garden. We managed to get a few things done nonetheless. that we sowed last weekend germinated. We are on a roll, people. the worry about pests becomes diminished. On this plant, you can see the set of "true" leaves growing. They're the jagged looking ones in the middle. 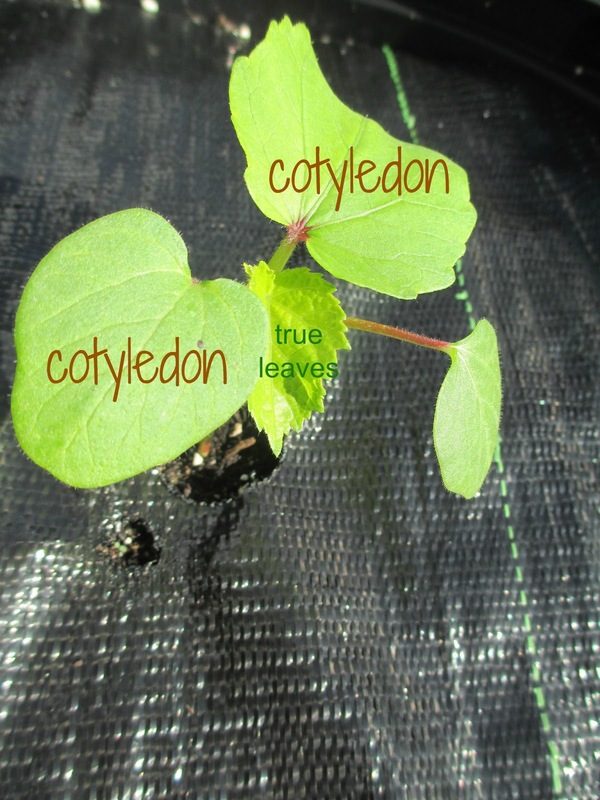 The first leaves to emerge are called cotyledons. until the "true" leaves start photosynthesis. The beans are doing amazingly well. They are growing in a shadier area to beat the heat. from some sort of copper problem. so it's hard to know the cause. was to clean up these pots of spent coriander. and discarded any remaining debris. They'll be reused for another crop. A brown widow spider was found alongside one of the pots. Glad Lynn saw her before she saw him! Lynn took care to repot this dill which had volunteered. Each crop is appreciated and treated with respect. Another task that needed completing was sowing beet seeds. but Lynn wants to see if he can stretch the season. The sowing date is marked for each crop. Seeds are sown 2 inches apart, so we can fit 8 seeds per pot. but a gal can dream, can't she? to keep track of just how many seeds needed replanting. The leeks are getting tired of the heat. but not before I brought a couple home to stock the freezer. Lynn has some starts for transplanting all ready to go. There was time to visit a few fascinating specimens. had some new growth and surprises. and you can see some of its victims inside the pitcher. This lil' gem looks none too friendly either, huh? All kinds of treasures lie in wait. What a glorious way to spend a morning outside. It's a privilege to be able to help in any little way I can. Faye was chief harvester and I was on pest patrol. We started with the beans. We are on the hunt for leaf rollers. Here's what they look like when you roll the leaf back over. Here's another kinda critter and the damage it leaves behind. (or maybe it's my over 50 eyes). We saw a few different types of spiders. They like to hang out under the rim of pots. The beans are producing a decent amount of yummies. and prepared them with last night's supper. A few banana peppers of various hues were also harvested. You know they're good for you just by lookin' at the vibrant colors! Thus far, this is one of the crops with the least pest problems. into the small collar where the blooms emerge. They begin their feast there. were showing signs of trouble. were covered with some sort of antlike critters. this mottled pattern was appearing on some of the crops. we were able to take about 20 black swallowtail cats home to host. Love watching nature do its thing. Here's a new trick that Faye and Lynn learned about. and hung them near the cherry tomato plants. so they are willing to give these types of methods a go. but it's part of being a farmer. Fortunately, there are alternatives to pesticides. There's so much beauty here. So many wonderous creations of nature. Hopefully, Lynn will be feeling stronger real soon. With surroundings like this, it's gotta help a body heal. How do you keep those pests at bay? I'd love to hear any tricks you might have in the garden. but Farm School is still going strong. We're preparing for the fall garden. The garden has slowed down quite a bit. the heat, humidity and bugs have been destructive to summer crops. Last week I looked for leaf rollers on the leafier crops. the plastic pot liners of some plants. Sneaky little devils, they are. This is the "slow-bolt" cilantro that was planted a few weeks ago. We were disappointed that it didn't perform as we had hoped. All but one plant bolted within 2 months. due to its poor performance. Even the cherry tomatoes are withering with the heat. They were mighty good while they lasted! We've had an unusual amount of rain the last few weeks. was all but pummeled to death. the way he expects, he just keeps on trying. "Throw more seed on it and see what happens." although Lynn is not sure it is out of the woods just yet. We came home with about 30 of these babies. the fabulous opportunity to witness the metamorphosis. that I will share at a later date. Some of the newly-sown seeds are coming right along. Lynn said it's a matter of fragility. and must be handled with the utmost of care. They are always started in trays. to see if they can flourish without the extra step of seed starting. are always directly placed in their final growing spot. I had time to clean up a few pots containing peppers. so the job goes quickly. Skinks scatter through the aisles of pots playing tag. Lynn spotted this new growth on one of their banana trees. A fresh bunch like this will soon be emerging from the new shoot. There was some fill work being done on the property. the planning and sowing stages are revving up. Won't be long before we are steeped in seed trays. Think it's too hot to farm? Farm School rocks on through the summer heat. will be moved to their permanent homes. The okra hasn't been fairing well. and from year to year crops have various succession rates. Lynn decided to pull them out of the pots and start over. Here's some okra planted a bit later. by the time it reaches this size, the bugs are no longer an issue. not necessarily the taste that changes. I'm so happy that the beans are lookin' mighty fine. These have been planted in a shady area. I've been taking these home for a couple of weeks now. Basil not started long ago is growing strong. The edamame is harvested for seed when it gets to looking like this. Keep in mind, everything planted here is non-GMO. When harvested fresh, it's an excellent addition to salads. and Lynn wants to give them their own space to flourish. by scratching up the soil a few inches deep. This claw-like device does the trick quickly. Then the hole is dug using this method. The transplant is gingerly placed in the prepared hole. The top of the plant should be just above the surrounding surface. This will help provide valuable information for future planting. Some lil' guys might need a bit of support. and wraps wire around the stem ever so gently. from a past NZ spinach crop. We also sowed two kinds of lettuces. 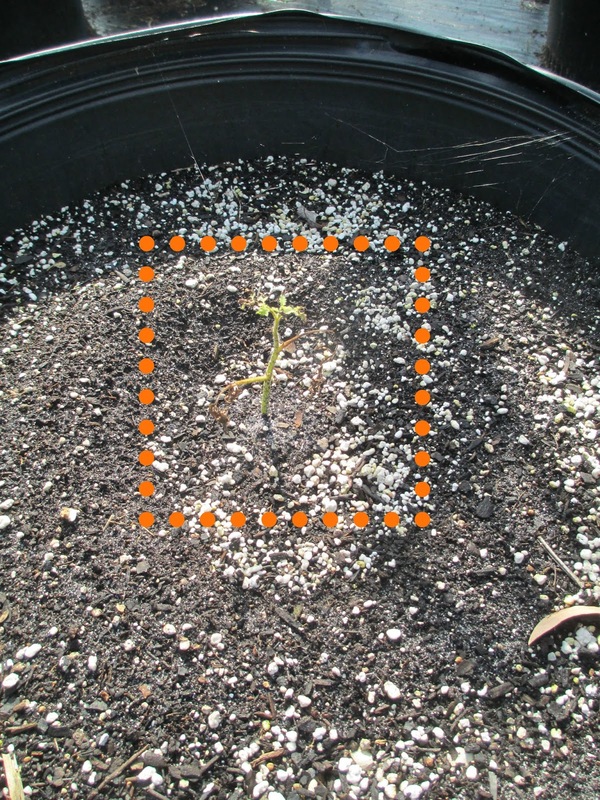 This time, three seeds were placed in each cell. Somethin's bound to come up! and placed in sun for a portion of the day. The banana tree is making progress since last week. Yeah, things are heatin' up in the garden alright! A few steps closer to the fall harvest. It never ends, this quest. but we still got a few things done. This part of the garden isn't seeing much action right now. and it's too early to expect much from the kale and Swiss chard. Seedlings, however, are going gangbusters! Seed trays cover the outdoor table and line the front porch. New lettuces are filling up the shaded area. to be ready for my supper table. These basil plants are spent. The planting date on these crops was September of last year. and letting it fall where it may. You can see the volunteers sprouting up in front of the potted plants. It'll make a gorgeous border, and so aromatic! after nearly being polished off by black swallowtail caterpillars. 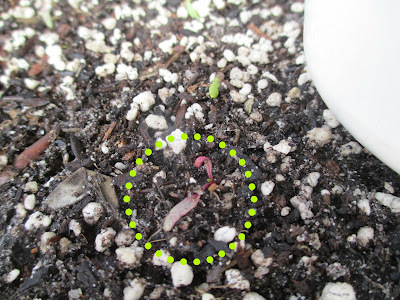 Seed is tossed nonchalantly, as it readily germinates. The bottoms will be secured with twine. The leek project began in earnest. These beauties were ready to graduate to larger pots. I transplanted three slender lovelies to each pot. Soil is added as the stalks gain height. We've got a good start! Lynn spied a wolf spider. but it's one of the good guys in the garden. it's time to head for shelter. The shower is much appreciated. but it was a pleasant surprise. It sure beat workin' in 90+ degree heat! It's the dog days of summer here in Central Florida. Can you believe that August is almost half over? I'm tellin' ya, after you hit 40, the years just zip by! Things in the garden are hoppin'. but others are just gettin' fired up! Lynn decided to do a little experiment with the beets. He's trying to see how far he can push the seeds he has. but mostly, they ain't doin' much. We reseeded them 12 to a pot this time, since we have nothing to lose. or if the seed is just too doggone old. The second undertaking was to plant summer squash seeds in an underused area. Here, Lynn is hilling up the soil. where the seeds will be planted. He checked for level using water to fill up the trench. We tweaked it a bit, and all is well. The ends were also built up to keep the water within the planting area. and they take full sun. We planted every 12 inches. We were able to fit twelve plants inside the prepared space. On the other end of the garden, we checked on the Swiss chard. we decided to do what we usually do when we don't get the desired result. Throw more seed at it! These eggplant were ready for supports. About half of the crops are looking very strong. It helps to have all the equipment you need at hand. is used to gingerly place onion sets into holes. the coveted white tops are abundant. Most of Lynn's tools have been passed down through generations. to keep supplies where they are used. He stores a myriad of materials in these weather-proof tubs. No need to go back to the shed or garage for needed items. Smart as a whip, that man is! while we were looking for leaf rollers. Have you ever heard of lighter knot? but didn't know what this was. Guess I've been hangin' around the wrong crowd, eh? It's used as kindling wood. Lynn has quite a stash of this valuable Florida treasure. Remnants of hurricanes in years past remain. Others bounced back and grace us with their majesty. We talked about the pitcher plant here. Seems that it wants to make a new friend. It was a red letter day here on the farm. Being productive leaves one with a sense of purpose. but planning (and planting) of the fall garden is underway. Thankfully, overcast skies made our work a bit easier. Today we focused on tomatoes. were going to make their way into the main garden. These are the Celebrity variety. This is what they look like when they're all grown up. so we were on to filling the rest of the pots with these magical treats. We posted Lynn's method for planting these here. we moved onto the next tomato task. These cherry tomato plants were looking mighty tired. They just didn't perform as well as expected this year. a couple of Roma starts. but we didn't have much success with them. Hopefully, the timing of planting will improve our chances. with a loving thought for their health. Much of the okra is still doing well. It's one of the few crops that will bounce back in the summer. Faye showed me this cool retractable rake. or fanned out for larger areas. Made of aluminum, there's no need to worry about rust or corrosion. and get a jump on the fall growing season. to reflect on future gardening goals. of the fall planting season in Florida. We are blessed to be able to farm almost year-round. and we found plenty to do. Each session starts with an overview of the week's activities. Lynn has been busy nurturing these Red Caribbean papaya. They were started with seed he gathered from his own crop. and readied for sale at the farmer's market. Most of the beans have been pulled up. They suffered from this type of rust. Lynn decided that he will try to treat them with copper. Okra is the crop that is doing the best in the summer's conditions. It continues to produce without concern for too much rain, sun or bug damage. The leeks we transplanted a few weeks ago are holding their own. There are a few eggplant that are doing fairly well. It's too soon to see if they will flourish. Blossoms can be found on established plants. New transplants wait their turn for a spot in the garden. Today we transplanted some tomato seedlings. First pots were filled with a loose soil mixture. Lynn introduced the concept of "coring" to me. The perfect depth for the new seedlings. to use in different applications. Today we potted up Celebrity and Sweet Million tomato varieties. I can almost taste the sweet juicy jewels. This Confederate Rose was featured here. Today Lynn wanted to take a few cuttings to root. moistened with water and saturated with rooting hormone. 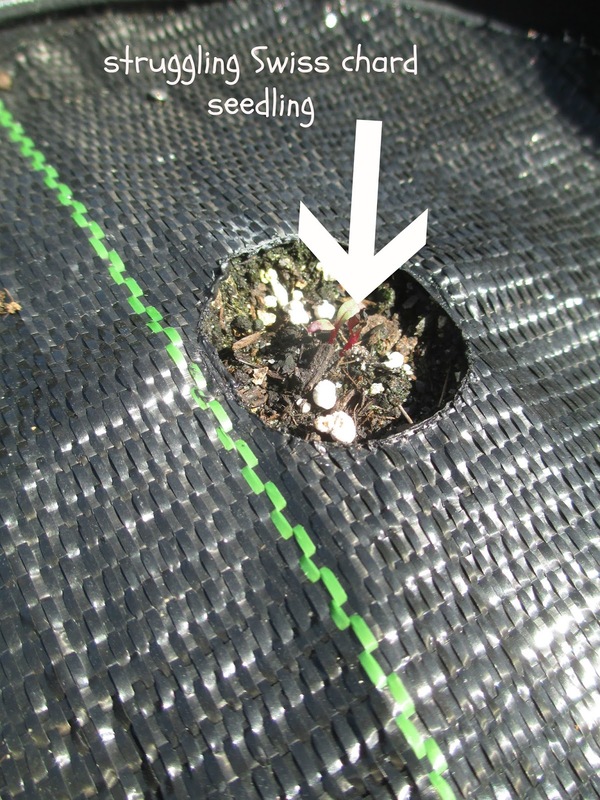 The cutting is placed in loose soil mix with the rooting hormone just peeking out. Looking forward to seeing how well these cuttings do. Faye's been working hard this week at cleaning and tidying up the rest of the yard. This is called a cardboard palm. Yeah, it really does feel like cardboard. Look at this nice family of ball peen hammers. and making way for the fall garden. witnessing the transformation of the farm. but the fall garden is underway here in Central Florida. Have you heard of edible hibiscus? I tasted a leaf or two and it has a slight tang to it. It could be a unique addition to a mixed salad. so these were pulled out during Faye's clean up. The Romas that were installed two weeks ago did not fare well. Never fear, there is no lack for 'maters in these parts. This lovely display will soon be transplanted into larger containers. Celebrity and Sweet Million tomatoes. The cells which house the most sprouts are sown from new seed. The less abundant cells are from last year's seed. It's important to pay attention to details. and will be finding a new home in the garden soon. They will be a welcome addition to our supper table. We had sown beet seeds a few weeks ago without much success. We weren't sure if it was because of the seed, the weather or the time of year. Again, new seed was replanted and this is the result. The dill had been covered to discourage butterflies from laying eggs. so Lynn took the covers off and they came back to life. we'll be collecting them every week as needed and hosting them back in my garden. Today we transplanted these beloved banana peppers. they were being added to everything from salad to pizza. Any available pots in the pepper area were used. These are partially covered in shade cloth. These funky things help the peppers get the best start possible. through time and experience as a gardener. The metal stakes are fitted with small expanses of wire. Yeah, he's mighty good at this stuff. We direct-sowed about 20 or so kohlrabi. It's a cold weather crop in the brassica family. just to the left of the beans growing here. Can I tell you how psyched I am about this? turn into the most sweet, juicy, and tender morsels you can imagine. We follow the instructions on the package for best results. As you can see, we should be enjoying these within a couple of months. Lynn and Faye shared with me the history of their vast tool collection. These cleavers have been handed down. Many of the tools have been handmade. These have a multitude of uses both inside the home and outside in the garden. Look how this metal was forged to create a handle. they use this bucket filled with rocks to hold their umbrella. Faye suggested that it could be used for shepherd hooks as well. This native coffee plant boasts bright red berries in a sea of green. So many wonders of nature lurk here just waiting to be discovered. Hoping your fall garden is getting underway! Just popped over from sherry mitchell-farm girl, and really enjoyed the farm school tour. I noticed only containers. Is this how they garden? Yup, that's it. They want to garden for the rest of their lives, so it helps that they don't have to stoop down to tend to the plants. They also don't have a problem with nematodes. It works! Thanks for visiting!